East Palo Alto, CA 94303, U.S.A.
Take BART Rapid Rail bound for Pittsburg/Bay Point at BART SFO Station on the Departures Level of the International Terminal. At San Bruno Station, change to BART bound for Daly City/Millbrae, then get off the train at Millbrae Station. Walk to Caltrain Millbrae Station, change to south bound Caltrain, then get off the train at Palo Alto Station. Change to Sam Trans Bus #281 bound for Onetta Harris Center, then get off the at University Ave & Woodland Ave.
Then walk to 1950 University Ave.
Take VTA airport connecting bus "Airport Flyer #10" bound for Santa Clara Caltrain Via Airport (no charge) at the front of the Airport Terminals. Get off the Airport Flyer at Santa Clara Caltrain Station. 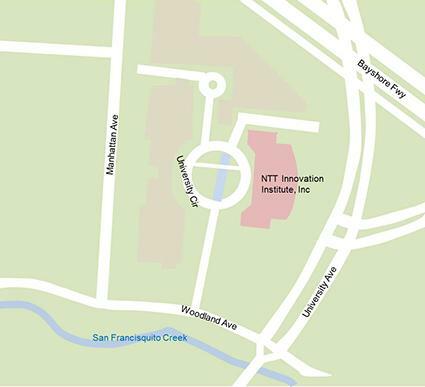 Walk to Caltrain Millbrae Station, change to north bound Caltrain, then get off the train at Palo Alto Station. Please check Web Sites for schedule information. Exit Highway 101 at #403 “University Avenue”.